Fashion icon Iris Apfel, why some linguists believe 'vocal fry' undermines women, living with Alzheimers, and 'having it all' and risking it for an affair. Jenni Murray presents. Ninety-three year old Iris Apfel is celebrated for her flamboyant style and her trademark giant glasses. She's the subject of a new documentary and she joins Jenni to discuss her impatience with banality, ageism in fashion and her love of accessories; why some people who "have it all" risk it all by being unfaithful, with journalist and novelist Rosie Millard and Susanna Abse from the Tavistock Centre for Couple Relationships. A year ago Wendy Mitchell was diagnosed with early on-set Alzheimers disease. Since then she's started a blog to "write all my thoughts before they're lost". She describes living with the disease. Vocal Fry, so called because it causes the voice to sound hoarse and dried out, is the latest trend in the speech patterns of young women. But is it undermining them and causing them to be taken less seriously? With author and journalist Naomi Wolf and Professor of World Literature at Oxford University Dr. Elleke Boehmer. Adultery - Why are some people unfaithful? 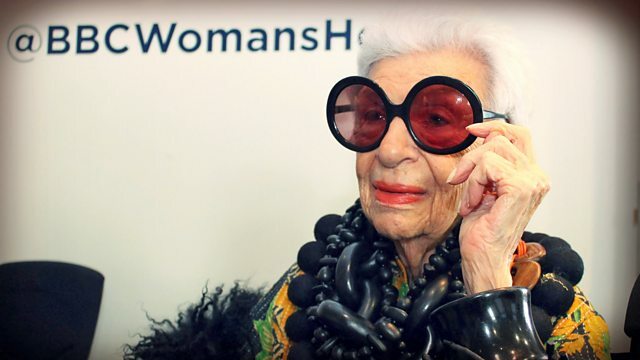 Ninety-three year old Iris Apfel is celebrated for her flamboyant style and her trademark pair of giant glasses. She ran a very successful textile business with her husband until her retirement in the 1990s. It wasn’t until The Costume Institute at the Metropolitan Museum of Art in New York put on a collection of her clothes, ten years ago, that she became a well-known public figure. She’s the subject of a new documentary , ‘Iris’, released tomorrow. She joins Jenni to discuss style, her impatience with banality and ageism in fashion. We talk about “having it all”; the perfect family, house, job but what if it’s not enough? Why is it that for some people having it all includes being unfaithful? Psychoanalyst and chief executive of the Tavistock Centre for Couple Relationships Susanna Abse and Rosie Millard, whose new novel is about the racy indiscretions of wealthy North London residents discuss what drives people to risk it all for an affair. The Square by Rosie Millard is published by Legend Press in August. This time last year Wendy Mitchell was diagnosed with early-onset Alzheimer’s. Since her diagnosis she’s started a blog so she can “write all my thoughts before they’re lost” She talks to Jenni about the strategies she’s developed to help her live with the condition and how her life has changed over the last twelve months.